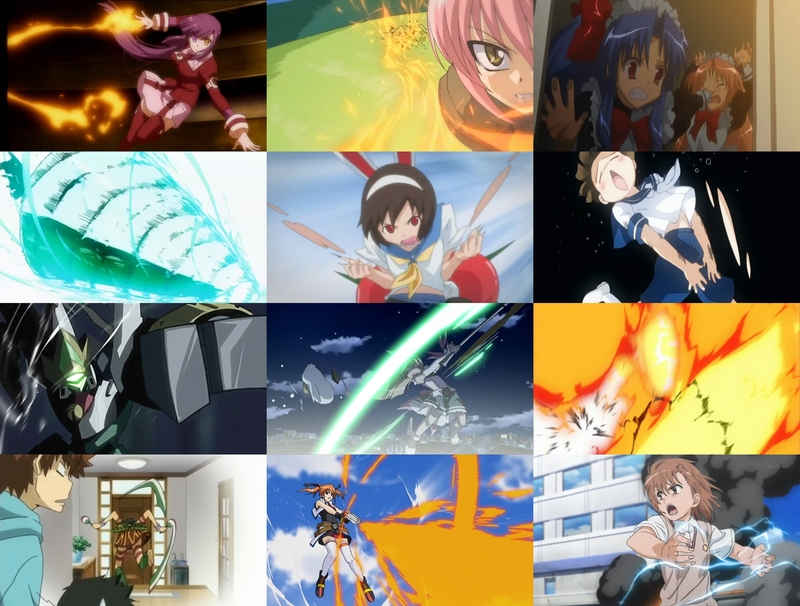 To put it bluntly, I wasn’t particularly satisfied with the first two ‘Anime no Chikara‘ series as the first one (So-ra-no-wo-to) was technically well-made yet didn’t make any mentionable effort to break out of generic anime patterns and the currently airing ‘Senkou no Night Raid’ is extremely dry and a bore to watch despite its interesting setting. So I am earnestly hoping that, as the saying goes, “The third time’s the charm” and A-1 Pictures will finally present something worthy of the projects’ ambitious name. 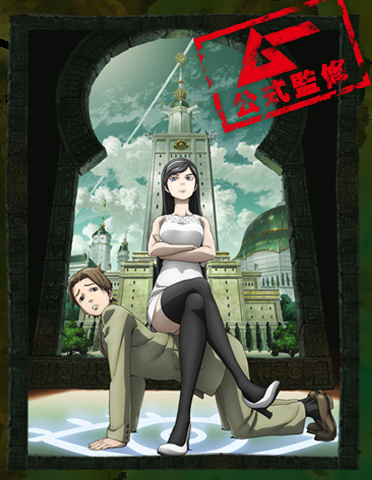 Considering the staff of the third attempt – “Occult Academy” – it has at least a solid grounding and starting point with some really talented people in key positions. First, there’s director Tomohiko Ito who has an impressive record of works for all that he’s never directed a series or movie before. Recently I had an ‘aha moment’ when I found out that Tokiichi Kagurazaka is his pen name as suddenly everything began to make sense. I had always wondered who was behind the laid-back feeling and Hosoda-like elaborate framing of ‘Michiko to Hatchin’ #4, so it makes perfect sense that Tomohiko Ito had been in charge since he was the assistant director of “Toki wo Kakeru Shoujo” and “Summer Wars”. If there’s an animator who really stood out in Bones‘ second incarnation of ‘Fullmetal Alchemist’, then it’s certainly Yoshimichi Kameda [亀田祥倫]. His animation is what Yutaka Nakamura‘s work was to the 2003 version, in other words he’s the secret star of the show. Kameda wasn’t on my radar until FMA, though hardly surprising since he began his career just three years ago, in 2007. Apparently, he started out at AIC and did his first key animation on the 20th anniversary special ‘Oh My Goddess: Fighting Wings’. Kameda also worked on several of Hiroshi Ikehata‘s episodes (Soul Eater #34, Zettai Karen Children #27/#37), but he was credited with a synonym (Sukiyo Sazan) so his name didn’t ring a bell at first when he began doing that great work on Fullmetal Alchemist under his real name (he used that alias on episode 5, though). 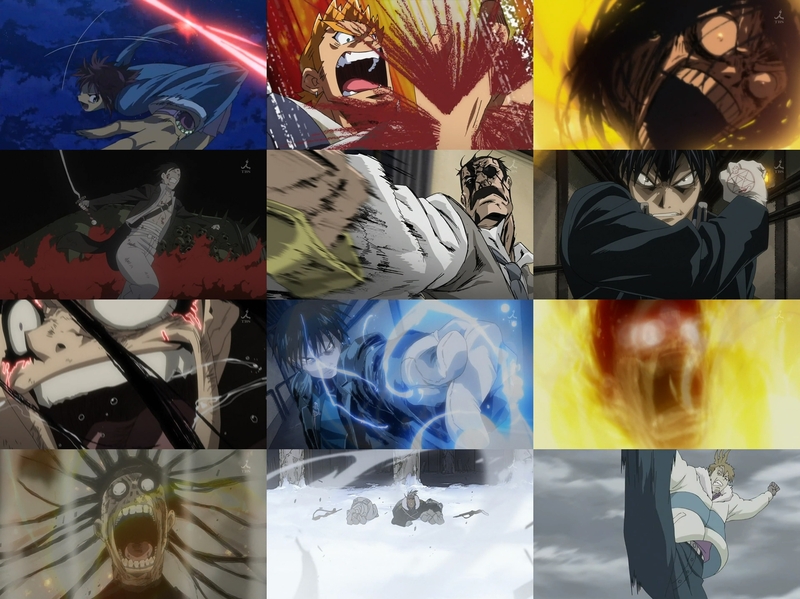 He quickly became a favorite of Japanese animation fans because of his amazing scene in episode 19 (Mustang burning Lust to death) which is really mind-blowing in view of the density and intenseness of the animation and beauty of the effects. According to the official blog, 10000 drawings were used for this outstanding episode and I dare to bet that this came about mainly due to Kameda‘s part. He was even credited for inbetweens so he obviously wanted to keep full control of his cuts. One of the lesser known – yet very skilled and present – effect animators these days is Hiroyasu Oda [小田裕康]. He began his career as animator at Magic Bus and has apparently never cut his ties with that studio since you can still find him working for them every now and then (such as Magic Bus‘ ‘Katekyō Hitman Reborn!’ #179, to name a recent example). Oda is one of those young animators of recent years who have come up with their very own individual style and as such it’s not really surprising that he is also involved in aho_boy‘s aka Hiroshi Ikehata‘s episodes from time to time. Incidentally, it was Oda‘s work on Ikehata‘s ‘Hayate no Gotoku!’ #39 that first brought him to my attention as – even among all the great animation in this almost legendary episode – his short yet very impressive part stood out. Not just because of the effects, but also in virtue of the thrilling framing and the wonderful movement. Take a look at the images of this scene below, he adds much dynamic to this part by moving both the character and camera resp. background. This is the kind of action I like to see in animation.